Does Your Car Transmission Need Repair? Your car transmission is a pretty awesome device. The way each part of the transmission, the bell housing, gears, the filter and the transmission fluid, all work together to send power to the wheels and keep them rolling. Your transmission also knows how and when to shift the engine smoothly from one gear into the next and does it, at exactly the right time. At least that’s what it does when the transmission is performing the way it was designed to! But what happens when your car transmission needs repair? There are a few things to look for such as: leaking fluid, unusual noises, whining or clunking, rough shifting or grinding. For a more detailed explanation of these symptoms, read How to Determine If Your Car Transmission Needs Repair. Give us a call at (303) 691-2760 or come in and see us. 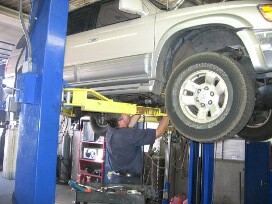 Filed Under: Car Maintenance, Transmission Tagged With: Does Your Car Transmission Need Repair? Hey!!!!! Thanks for the article. Car must need a transmission repair. Lately, my car has been making noise, leaking fluid, and shifting gears hard. After reading I think it maybe the transmission. I’ll make sure that a professional takes a look at it, and I hope they can take care of my car. The car transmission is a pretty awesome device. Each part of the transmission namely the bell housing,gear,filter,transmission fluid all work together to send power to the wheels and help them to roll. Transmission changes the the gear of the engine there by transferring the engine power to the wheels to move the vehicle ahead. If the transmission is not performing in the way it is designed, that means some whining clunking noise is coming from or fluid is leaking then it needs to be repaired. When the car shows starting problem, it is best to call a mechanic to check the transmission. Transmission plays crucial role in the performance of the vehicle and needs regular maintenance like other components of the vehicle. Any abnormal signs associated with the transmission needs to be addressed in time to prevent any major problem. Apart from this, transmission fluid used for the purpose of lubrication needs to be inspected properly. Because of lack of appropriate lubricant has adverse impacts on the performance of the vehicle. Replacement of transmission oil after certain time interval is really essential to ensure smoother performance of the transmission. Really it such an informative post. Your blog is essential for all, you have guided on a good issue. Thanks for sharing such a valuable post and Keep Posting! Transmission is one of the complex components that does not fail so often. But when it fails, it becomes an expensive hassle to fix. So, it should be cared and repaired right away if any flaw occurs in it. By doing so, you can avoid the possibility of replacing the whole transmission box and burning a hole in your pocket. Preventive maintenance is highly obligatory for keeping the speed machine running at its best performance. Anyways, thanks for this edifying enlightenment.